Following a discussion on Twitter with Daniel Gregory about the retreat line rule in youth soccer, and the pros and cons of that rule, I have posted a few thoughts about how we set up our team to ensure that the defender who receives the ball always has a pass they can make. More generally, we always tell our boys about movement off the ball and to imagine that there is an invisible line between the ball and them at all times. If that invisible line has an opposing player on it, you need to move in order to find space to receive a pass. Having that invisible line in their head is a way of them constantly checking to see if they are in a good position to receive a pass. Specifically for goal kicks, we set the boys up very narrow in a 2-2 formation (Square) with both defenders roughly in line with the goal posts. This leaves space on the wings, as the opposing players who are waiting to charge from the half-way line will generally mark our players. So if our players are very central, so will the opposing players be. On the training pitch, we show the boys what that looks like on the 24/7 Coach app (see picture attached) and then set the boys up in that position so they can ‘feel’ what that set up looks like. As soon as the goalkeeper kicks the ball towards the defender on the left-hand side, the opposing players have started to run towards the ball from the halfway line. It of course varies from team to team, but it is usually 2 or 3 players that bomb forward. At least 1 of those players will head for the defender who is about to receive the ball. The defender receives the ball, as the opposing players rush into your half. As the defender receives the ball, they are close to being closed down from the opposing players rushing from the halfway line, but if the pass from the goalkeeper is solid enough there should still be time to control and turn. 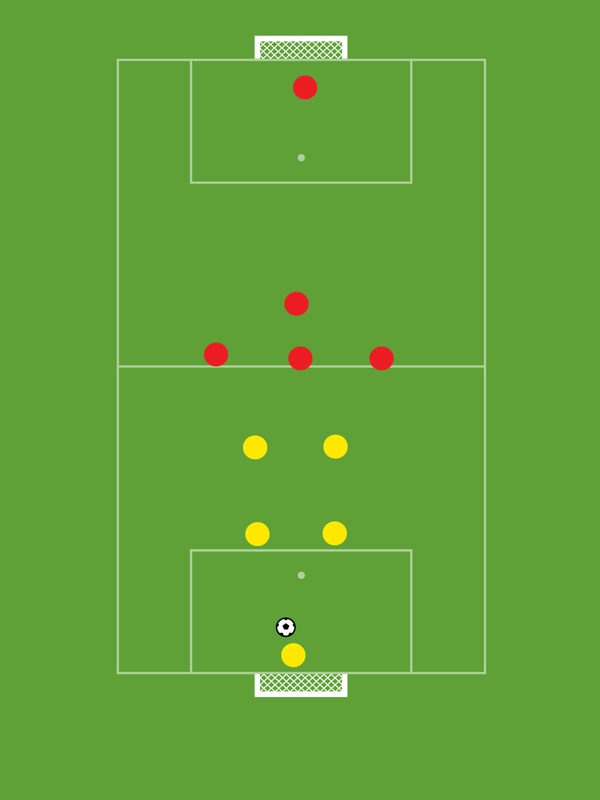 As the defender is receiving the ball, the forward on the left-hand side makes a quick run out towards the touchline, creating sudden space, which the defender can then use to pass the ball through before the opposing defender reacts. As the defender gets the ball under control, the forward darts wide to create space to receive the pass before the defender can react. Id be very interested to hear your feedback on this, or any coaching points related to it in the comments? This looks like a perfectly good drill yes. Its simple, covers the initial pass (distance, angle, weight) and the players / team reacting to it and creating further options. Is there a rule preventing the player from passing the ball back to the goalkeeper? If not then you could look into another variation / progression drill involving a 1-2 pass in a 2 v 1 situation? The fullback receives the ball and draws in the opposing striker to create a 2 v 1. He then passes back to the goalkeeper who the opposition striker inevitably presses. Your fullback then drops to create a better angle and receives the ball off the keeper. This will take the opposition player out of the equation as is now behind play. If you have the winger making the same move as in your original drill and the full back advancing with the ball, you will have created another 2 v 1 against the opposing fullback. It may take a bit of unopposed work and marker cones to get the angles and movement required but im sure it could be a good progression drill? Hi Russell, thanks for the comment. Definitely one to consider for an older group though. Previous Previous post: Retreat line in mini soccer is a good thing … do you have a different view? Next Next post: How would you have countered Mourinho’s tactics yesterday?